What is a Primary & Secondary Tourist Resource? Map out the main attractions in Venice. Click on 'Sights’ (Primary) and comment on the location and spread around Venice. Take a screen shot and add the image to your word document underneath your description. Annotate other Primary Resources onto your map of Venice. Using the same website, one by one, overlay shopping, restaurants and entertainment to the map. Take a screen shot of each and comment on the distribution and location of these features in relation to the primary features. Strategies to avoid environmental damage. Evaluate the strategies to manage tourist demands, maximize capacity and minimize conflicts between local residents and visitors and avert environmental damage in an urban area of your choice. Don't forget the 'Impact Introduction Statement' at the beginning. Head down to South America and to Peru where one of the most famous 'Bucket List' rural destinations finds itself under threat from tourism pressure. Let's transport ourselves straight to the focus of study! Use this worksheet blown up to A3 size to record your case study. The number of visitors to Machu Picchu each year has grown from the low 10,000s in the 1980s, to a peak of nearly 1.2 million tourists in 2013 – a 700% increase! 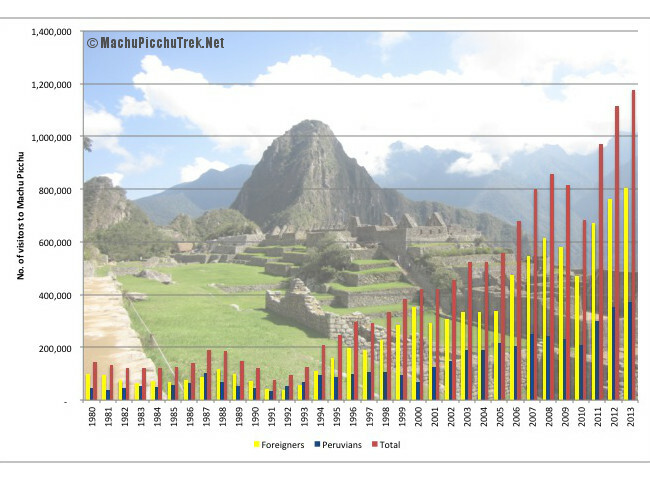 The chart above shows how many tourists visited Machu Picchu annually from 1980-2013. The yellow bar represents foreigners and the green bar, Peruvians. Guidelines: 20 minutes of writing. 1 - 1.5 pages of handwritten work. 10 minutes planning time. Use the A3 worksheet to help you.